About a year ago I was in my local bookstore and saw a little mass market sticking out of alignment from the rest of the books. At the time it seemed like it was beckoning me. The book turned out to be the most ambitious steampunk novel I've read called Whitechapel Gods by S.M. Peters which was his debut novel. I don't think it got noticed as much as it deserved when first released. The striking cover is perfect for the story which evokes a Victorian England where there is a disease turning people into machines. If you are a fan of steampunk than by all means get yourself a copy of Whitechapel Gods. 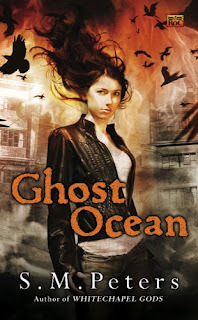 With Ghost Ocean we see Peters turn his able sextant to Urban Fantasy. Judging by its cover of a pretty girl in a leather jacket it could be lost in the sea of other Urban Fantasies, but it is definitely a cut above the average. Ghost Ocean is very strange with the most bizarre cast of characters placed in the fictitious town of St. Ives where it is almost always raining and monsters of all kind dwell. Told from multiple view points and jumping around in time and memory it could take a little while to get a handle of what is going on just in time for Peters to change the rules, however it is well worth the effort. The story completely fakes you out from what you think is going to be a daughter's search for her father's killer, but is more about the ancient evils that surrounds Te, the main protagonist. Te is a paranormal investigator in training to Babu Cherian who worked with her father before his death five years prior. Along the way you learn Te has been held in the dark about nearly everything and everyone in her life as her father wanted to shield her from this life. It is actually surprising how well adjusted she is given her upbringing by a clearly uncaring mother and a mostly absent father. My one caveat is Te's relationship to Jack, her doting neighbor, in which she leads him around like a puppy into trouble time and time again. But to Te it is all about filling the gap of loneliness inside of her and Jack also provides her a connection she needs to stay grounded. After a very powerful monster escapes its prison Te is brought in on the secrets of her father's past and into Babu's mysterious group of monster hunters in search of the creature. My favorite character from the odd group is probably Munin who is mathematical genius/mad scientist with a toy ray gun. All over St. Ives there are creepy crawlies aching to be set free. The grotesque description of many of the creatures, most notably Bird will stay with you for a long while as will the freak people that surround her. In some ways Ghost Ocean is a dark version of American Gods with Peters' use of mythology and his own inventiveness able to make it stand apart. Ghost Ocean is a wild adventure that keeps pushing harder and further to up the stakes. Fans of Neil Gaiman, Simon R. Green, or Christopher Golden should definitely find Ghost Ocean engaging and fresh. If you are a guy who loves Urban Fantasy, but have trouble finding new books beyond Dresden and John Taylor give this one a try. I give Ghost Ocean 8 out of 10 Hats. It is clear that Peters has a long and bright future in front of him as his writing has improved between books. I'll be checking out anything he writes in the future. I'm hopeful Peters gets moved up to a hardcover or at least trade paper release for his next book as I'd love to have copies that will hold up on my shelves. Book Link: US Canada UK Edit: See interview with S.M. Peters here. I read Whitechapel Gods which is indeed an ambitious steampunk novel but it didn't really work for me. I felt lost during reading. I haven't read Whitechapel Gods yet... But Ghost Ocean has become my new favorite novel, and S.M. Peters, my new favorite author. This book is FANTASTIC! After I finished reading it the first time, I started reading it again (and I almost never do that). At the end, it seemed like there was enough plot material left for a sequel... I can only hope fervently that that is the case. Depending on what his publisher wants to do we should see more books in this world. Check out my interview with Peters for a little more detail. If I may leave you a recommendation for an urban fantasy series? The Kate Daniels series by Ilona Andrews is one that you may enjoy. It is one of the best (besides Charles deLint) that I have found.